Editor’s Note: This is the cover story in the February issue of RISMedia’s Real Estate magazine. Subscribe today. While the growth of agent teams has been prolific in the last decade, and the effectiveness of the team model has been proven many times over, the art of forming, operating and succeeding with an agent team is complex, and requires dedication and a commitment to changing with the times. As teams have evolved, so have the dynamics of creating and running a winning agent team. Ten years ago, RISMedia published “Power Teams: The Complete Guide to Building and Managing a Winning Real Estate Agent Team.” Although teams are still defined in much the same way—two or more agents working together for a common purpose—what has changed is the staggering amount of business today’s Power Teams are closing, the rising sophistication of their professional and operational skills, and their adaptation of the latest technology and marketing resources. That’s why RISMedia has also evolved its coverage and offering for agent teams, whether you’re just exploring the team concept or whether you’re ready to take your team to the next level. In RISMedia’s Ultimate Real Estate Team Guide, by RISMedia Associate Content Editor Liz Dominguez, we interview many of the nation’s most successful real estate teams to uncover their best practices for winning with the team model in today’s real estate environment. 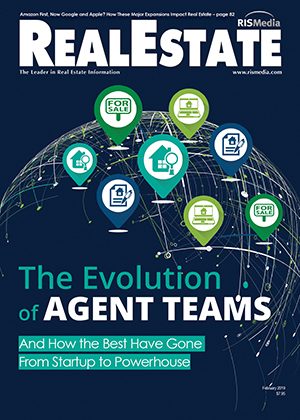 RISMedia’s Ultimate Real Estate Team Guide is just one facet of our ongoing coverage for and about Power Teams in 2019. You can find more in our weekly Team Tuesday enewsletter, filled with team profiles, trends and business development strategies designed specifically for team success. The team structure brings with it many high-level challenges, all of which can be tackled head-on with the proper tools and by taking the necessary steps to protect and educate yourself and your team. RISMedia’s Ultimate Real Estate Team Guide helps you address these challenges through our research and the expert insights of top-performing teams across the country. Remember, in the world of real estate teams, there is no one-size-fits-all solution; however, the path ahead will be easier and more successful for those who educate themselves. Following are excerpts from the first volume of the Ultimate Real Estate Team Guide. Forming a team can have myriad advantages for all agents involved; however, it is a complex process that involves a lot of legal consideration. Sara Guldi, REALTOR® and owner of The Guldi Group at Keller Williams Realty in Maryland and coach at Workman Success Systems, manages a team of eight, including her administrative and support staff. Before forming a team, agents must consider how they’ll register it as an official business entity, as it will not be legally valid until this is done. Reed has worked in the real estate industry for 30 years. Her team is made up of three partners, three staff members, one assistant and 11 agents. When it comes to teams that work in more than one state, the legalities of broker-imposed regulations can become a little more complex. Guidelines vary between states and are changing quickly. Although not always written out, core values are a set of goals and rules by which all companies run their business. When forming a team, these values can be the glue that holds all members together. Most teams use their core values as a type of contract by which their agents must abide. Jeff Ruff, co-owner of Vutech | Ruff at HER Realtors®, formed his team in 1993 with his business partner, Marilyn Vutech. The team currently has 11 licensed agents. Todd Crockett, partner at The Crockett Team of Howard Hanna Real Estate, has worked in real estate for 40 years, 24 of which have been spent on a team. Currently, he manages a team of 20 agents, a marketing manager, a listing service manager and two closing coordinators with his wife, Judie, as his partner. The Crockett Team Core Behaviors were created as the team evolved, focusing around six guiding behaviors that set them apart from the competition: Collaboration, Innovation, Adaptation, Implementation, Clarification and Reiteration. 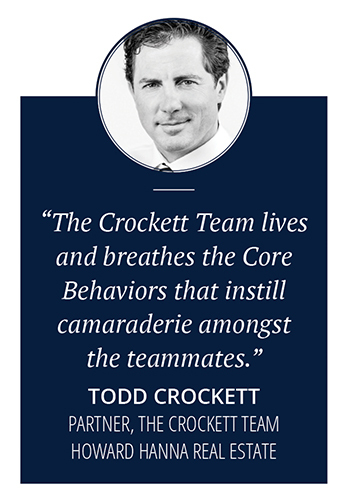 “The Crockett Team lives and breathes the Core Behaviors that instill camaraderie amongst the teammates,” says Crockett. Knowledge is power when it comes to numbers; therefore, it is imperative that team leaders stay up-to-date on finance language and the diverse options available for payroll, accounting, bookkeeping, etc. Teams have different approaches to tracking their finances. Many newer or smaller teams prefer to take on more responsibility themselves. Abbe prefers to take on a portion of the financial tracking, as it is manageable for his team of three selling agents and two support staff members. However, he delegates the accounting responsibilities to a professional. Of course, determining what the numbers are is not enough. Once spending and revenue are tracked on a monthly basis, teams must formulate budgets and business plans based on the trends they see in their financial history. 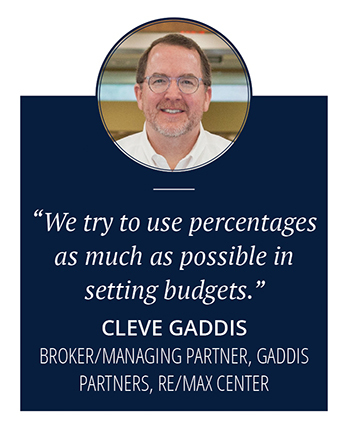 “We try to use percentages as much as possible in setting budgets. As an example, we want our marketing, lead generation and conversion costs for buyer clients not to exceed 25 percent of the company dollar,” says Gaddis. In addition, adjusting to changes in the market and changes to the team’s spending should be part of everyone’s business plan. And with more experience comes increased elasticity in business planning and budgeting. Every new marketing product introduces a learning curve, not only to use the service, but also to determine how many leads it generates and if those leads turn into profits. 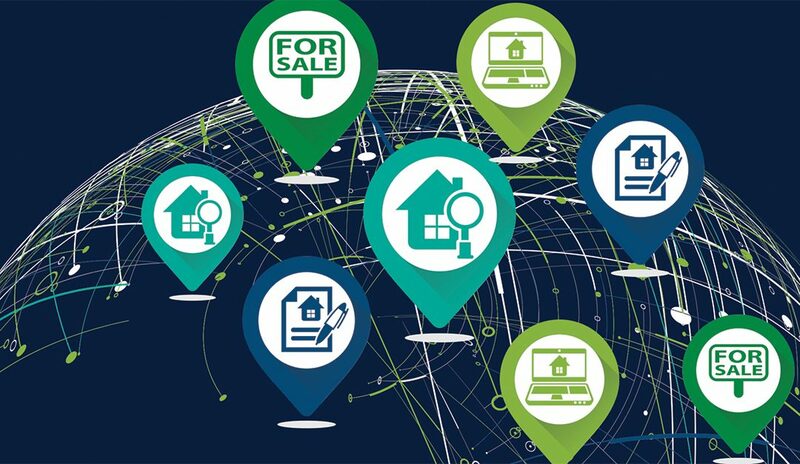 The real estate industry heavily relies on lead generation and conversion, and so marketing sources must be analyzed carefully, or business owners risk losing money and time—two of the most valuable assets for a real estate team. But how is the value of a product determined? There are many factors, but return on investment (ROI) is the most significant. Each team has to determine which products work best for their unique format and business style. In order to do this, they must first identify their team’s source of business—what makes them run and what drives profits. 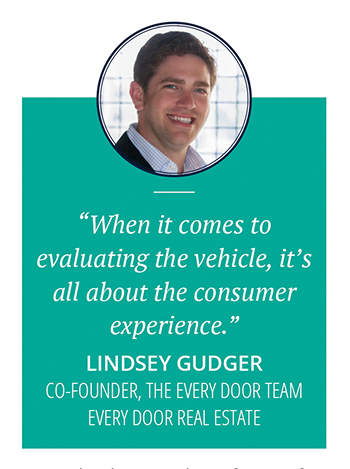 Lindsey Gudger, co-founder, with Jason Gasbarra, of The Every Door Team at Every Door Real Estate, has worked in real estate for four years, and lead generation sticks out clearly as his team’s most successful marketing venture. Once a profit source is identified, teams must find a vessel that works alongside it to create efficiency, streamline the process and provide results. This can be found in a third-party product or in technology offered through the brokerage. Whether the need is a CRM, a dialer, a social media presence or an online lead profile, it is imperative that team members research all possible avenues before deciding on a product. Sometimes, the best research comes in the form of recommended services that have been successfully implemented by other teams. A trial period is necessary to determine whether a marketing product is providing the necessary results, not only to generate leads, but also to pay back all expenditures. These trial lengths vary by team, lasting anywhere from a few weeks to a year. In terms of lead conversion, scale may play a role in timing, as well. Marketing strategies should be discussed at recurring team meetings and adjusted accordingly to adapt to changes in the industry. RISMedia’s Ultimate Real Estate Team Guide will be available for purchase in print and online in the coming weeks.